Raised in a deeply religious family, Mercy rebels against all rules during his teenage years. He stops attending church and drops out of high school. To avoid a destined path of self-destruction, Mercy enlists in the Army. After two combat tours, Mercy returns home battling PTSD. Trying to forget about the lives that he has taken and resume a “normal” life, Mercy returns to church. He enrolls in college and reconnects with a childhood crush. Mercy saved some of his men. Can he save himself? This is a story that is set on different time lines. The first time that I met Mercy was at the end of the story, which you will have to read to find out about it. The time line then drops back to the Autumn of 2007 and a journal entry written by Mercy. A war is raging in Baghdad and Mercy and his fellow Infantry unit are smack bang in the middle of it. A quick reality check that does anything but glorify war. Then a dash back to present day. 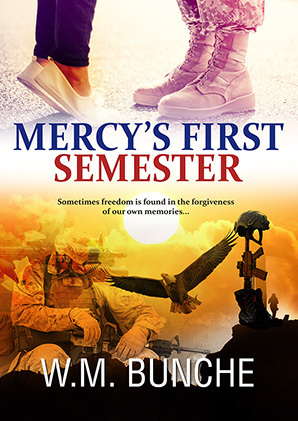 The story pieces together Mercy’s life as a child and teenager that doesn’t sort of fit in at home, to life in the American army and two tours of duty, to discharge and suffering the effects of PTSD, to trying to fit back into life at home and joining college. The actual real-time is only roughly a semester the rest of the book is through Mercy’s journal and memories of how family and friends thought of him. Their personal relationship with Mercy and how knowing him affected their lives. This is a brilliantly written novel as I just loved how the whole book came together. The stories of the different people were just perfect, as a father sees a son, as a teacher sees potential blooming and the army see a different side of him but I also saw how he sees things from his side, in his own mind. I loved his time in college and the writing course taught by Dr G. what a super character, if I could have signed up for his classes I would! It is here where a chunk of Mercy’s childhood is described. This author is an artist of words because from the horrors of war to the aromas of the traditional dishes cooked by Mercy’s family, it all comes vividly alive! Every colour rich and every sound heard. It is so hard to believe that this is a debut novel. It isn’t about what a war does to a man as much as the battles he faces internally all his life to fit in, before and after his time in the army. Through his writing he can express himself, just brilliant. W.M. Bunche is a decorated Cold War veteran. He attended public schools in Brooklyn. His military roots trace back to the Civil War. A wannabe athlete, he has completed the Marine Corps Marathon. He is a Columbia University honors graduate who lives in New York City with his family. WM Bunche believes in serving and maximizing his 24 hours each day. 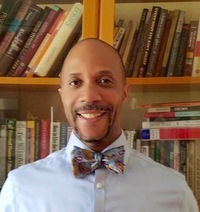 He serves as a church leader, a mentor and a veteran’s advocate. Mercy’s First Semester is his first book. I have been sitting on this book for quite some time, meaning to read it on vacation. Until I read your review I forgot that I had it. Thank you so much, I’m always up for good read. I will begin it this week.